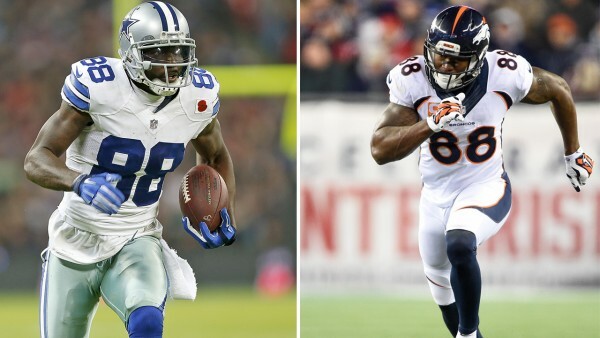 The Dallas Cowboys and Denver Broncos aren’t going to worry about star wide receivers Dez Bryant and Demaryius Thomas skipping training camp, preseason and regular season games. No holdout, as the two have signed on new contracts just before the deadline. Both players signed a five-year deal worth $70 million, paying them $14 million per season on average. If anyone needed more hints of collusion which the NFLPA is going to push towards (or maybe not now that the deals are signed), maybe the same kind of money suggests that as well, despite denials from the teams. Bryant gets $32 million in guaranteed money, including a $20 million signing bonus and guaranteed salaries of $3 million in 2015 and $9 million in 2016. The guaranteed money rises to $45 million if Bryant is still on the team’s roster on the fifth day of the league year in 2016, which triggers a $13 million payment for the 2017 season. His base salary for the 2018 and 2019 seasons will be $12.5 million. Thomas’ deal includes $43.5 million in guaranteed money. Both players are now tied for second in the NFL behind Calvin Johnson for highest paid wide receivers. With the salary cap on the rise, it’ll be interesting to see how these deals effect the kind of money A.J. Green and Julio Jones will be demanding from the Cincinnati Bengals and Atlanta Falcons when the 2015 season is over.